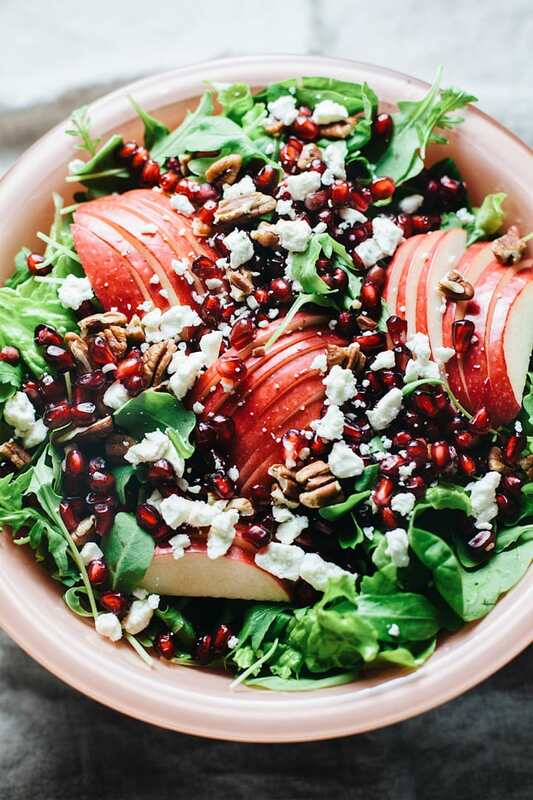 Apple Pomegranate Harvest Salad – A vibrant fall salad with greens, apples, and pomegranates with balsamic vinegar. An easy healthy salad and the perfect Thanksgiving side dish! 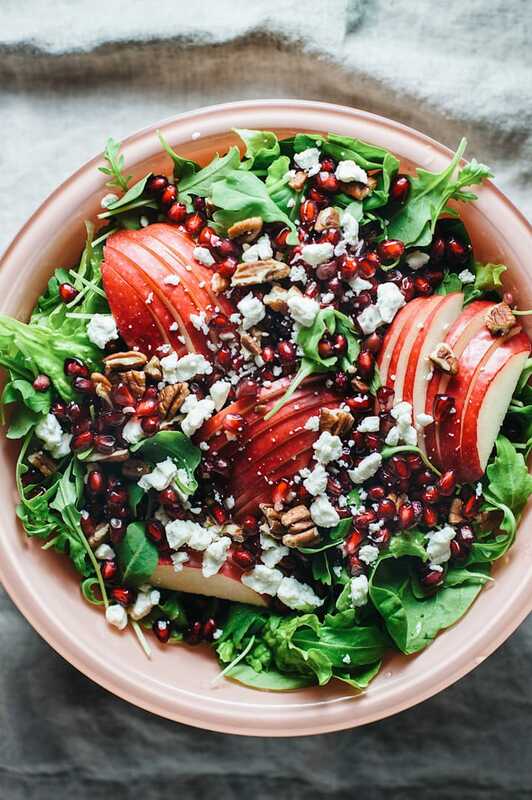 If you are looking for a delicious and beautiful fall salad for your table look no further than this Apple Pomegranate Harvest Salad. 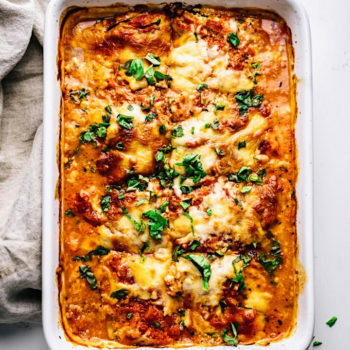 It is so easy, healthy, and always an absolute hit every time it’s served! For this recipe I chose honey crisp apples, you can also use other apples like pink lady, fuji, or gala. You can also substitute apple for pears as well! You can use any type of greens for the bed of this salad – kale, spinach, mixed greens, or arugula. 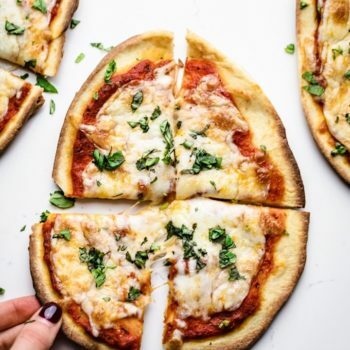 If desired, swap feta for goat cheese or blue cheese. This salad is the perfect addition to a fall meal you have planned or at your Thanksgiving feast. Even if you aren’t into salad – I can almost promise you will love this harvest salad! It is tart from the apples and sweet from the pomegranate seeds, and pairs perfectly with the tangy balsamic dressing. If you like this salad, you may also love my Detox Green Salad as well, equally delicious and healthy! 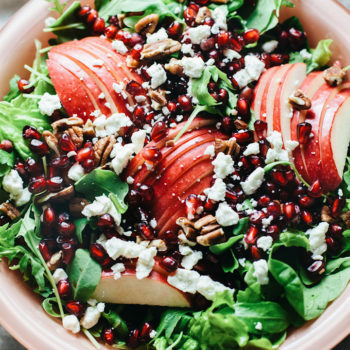 The easiest most delicious Harvest salad with apples, pomegranates, and crunchy pecans. The perfect side salad to any meal! Add greens to a medium to large bowl and arrange salad toppings as desired. In a medium bowl add all of dressing ingredients and whisk thoroughly to combine. Taste and adjust as needed. Drizzle dressing over top salad and serve! Dressing can be stored in fridge for 2 weeks sealed in mason jar. You can use any type of greens for the bed of this salad - kale, spinach, mixed greens, or arugula. Blue cheese, feta, or goat cheese also work for this salad - although I prefer feta cheese. Love the sweet and tart together with the feta cheese topping it off! Great salad for the hibernation season ? PEOPLE!! You have GOT to try this salad if you haven’t already! It is SO delicious! Made it the day after Thanksgiving for a lighter supper to give our bodies a break from the ton of food & desserts consumed the day before. 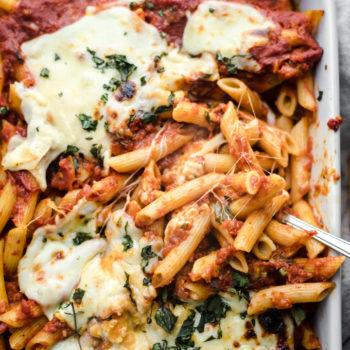 Perfect with some hearty multi grain rolls. I added some warmed up rotiseri chicken I had from a few nights before . . .delish! Also used blue cheese instead of feta, candied pecans instead of plain (hubby has a sweet tooth) and 1/4 of a granny smith apple & 1/4 of a honey crisp per salad. All those sweet & tart flavors make your taste buds sparkle! So, so yummy. Do not skip that dressing either . . .it is SO worth making it, only takes 2 seconds . . .measure all the ingredients into jar & shake . . .that’s it! . . .just the perfect finish for this salad!